Resin bonded stone combines different surfaces to produce a single uniform and attractive protective covering for a driveway path or patio. Tarmac, concrete or imprinted concrete, old and new, damaged or extensions. 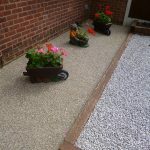 Resin bonded gravel and provide a single visual surface. Resin technology has advanced over the last 10 years or so. 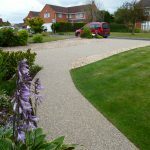 Two of the original uses for resin were for the roadways and in connection with heritage sites as resin bonded gravel provides an attractive entrance in keeping with the surroundings. 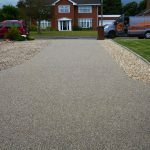 In addition Resin Bonded aggregate prevents the migration of stone which is always a maintenance requirement with loose gravel. Resurfacing with resin bonded stone requires minimal overall attention and can be installed without the need to remove the existing surface. When used on roadways (with the benefit of the potential minimal curing time) it can provide anti skid and warning properties highlighted by colour options available. Resin is also more popular with architects and landscapers not only for new builds but for redevelopment areas as resin bonded stone combines different surfaces the old and the new concrete, tarmac and even imprinted concrete can be seen as one seamless uniform area. Councils and local authorities are now utilising the use of resin as it is an extremely durable product whether it is Epoxy or Polyurethane the use of resin is world wide. One company who work within the commercial sector and supply and manufacture resins are Elite Chemicals which was founded in 1971 and is a leading independently owned formulator and manufacturer of thermo-setting resin systems. We have now been working within the residential sector for of 15 years and during this time have seen advancements in the use and efficacy of resin. One so far insurmountable issue is the inability to apply the resin in wet weather. 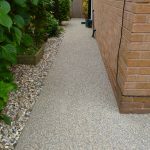 The resin bonded stone (as opposed to the resin bound which we also install) is the perfect answer to resurface existing surfaces. 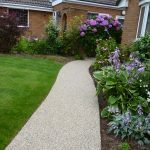 An alternative to the usual options for your driveway path or patio. If it’s not broke don’t fix it. We are based in Nottinghamshire but accessible to Yorkshire and Derbyshire areas. We have completed anti slip surfacing in Skegby, Aspley, Bilsthorpe, Ravenshead Bulwell, Clay Cross, Cotgrave, Doncaster, Fleckney, Huthwaite, Leamington Spa, Mansfield Woodhouse, New Houghton, Pentrich, Ravenshead, Sellers Wood, Shirebrook, Spalding, Sutton Bonnington, Toton, Warsop, Worksop. This entry was posted on Tuesday, August 9th, 2016 at 7:05 am	and is filed under Concrete, Diary of a Mansfield Resin Driveway Company, Driveways, Imprinted Concrete, Latest News, Mansfield, Paths, Patios, Tarmac and Asphalt. You can follow any responses to this entry through the RSS 2.0 feed. Both comments and pings are currently closed.